In two reports released last week, the Bureau of Justice Statistics (BJS) announced that for the first time since 1972, the US prison population had fallen from the previous year and that for the second year in a row, the number of people under the supervision of adult correctional authorities had also declined. In its report Prisoners in 2010, BJS reported that the overall US prison population at the end of 2010 was 1,605,127, a decrease of 9,228 prisoners or 0.6% from year end 2009. The number of state prisoners declined by 0.8% (10,881 prisoners), while the number of federal prisoners increased by 0.8% (1.653 prisoners). Fully half of the states reported decreased prison populations last year, with California (down 6,213) and Georgia (down 4,207) accounting for the biggest decline in absolute numbers. Rhode Island (down 8.6%) and Georgia (down 7.9%) accounted for the largest percentage decreases. For the first time since BJS started keeping jurisdictional data in 1977, the number of people released from prison exceeded the number of people sentenced to prison. Some 708,677 people were released from prison, while only 703,798 entered prison. "The stability in prison release rates and expected time to be served indicates that the change in state prison population between 2009 and 2010 was the result of a decrease in state prison admissions," BJS explained. Drug offenders accounted for 18% of state prison populations in 2009, the last year for which that data is available. That's down from 22% in 2001. Violent offenders made up 53% of the state prison population, property offenders accounted for 19%, and public order or other offenders accounted for 9%. In the federal prison population, drug offenders made up a whopping 51% of all prisoners, with public order offenders (mainly weapons and immigration violations) accounting for an additional 35%. Only about 10% of federal prisoners were doing time for violent offenses. Overall, somewhere between 350,000 and 400,000 people were doing prison time for drug offenses last year. 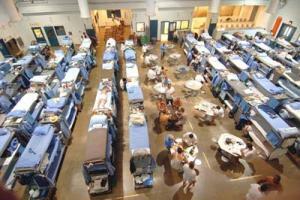 I give those "BUDGET CUTS" an major reason that the population of jails is declining. Now if we would cut costs by ending the war on drugs and treat drug abuse the way that we treat alcohol abuse. If Cannabis is 60% of the " Drug War " , and you legalize Cannabis , what does that do to the "Drug War " ? What impact would that have on your local " Jump Out Boys " ? JOB or OJOB ? Out of a JOB ? You do the math . Maybe they could find something else better to do . Nobody needs your input pothead. You just want to push your agenda to get freely get baked. The last thing the US needs is another legal substance for an already retarded population to get mess up. And a mainly inhaled substance at that, which others may involuntarily ingest. May want to consider there are many locals(small police depts.) that have given up going out on any thing but violent crime,IN PROGRESS, calls due to being understaffed. Hence he 'Drop in Crime'... it seems, victims don't fill out reports all that well, after having to go the Police house, instead of the other way around.